I love basil pesto and make a ton of it in the summer when I have basil growing outside my kitchen door, but in the winter, you have to pay an arm and a leg for enough basil at the store, so I searched for alternative recipes. I love arugula’s peppery bitterness on sandwiches and pizzas, so I started there. 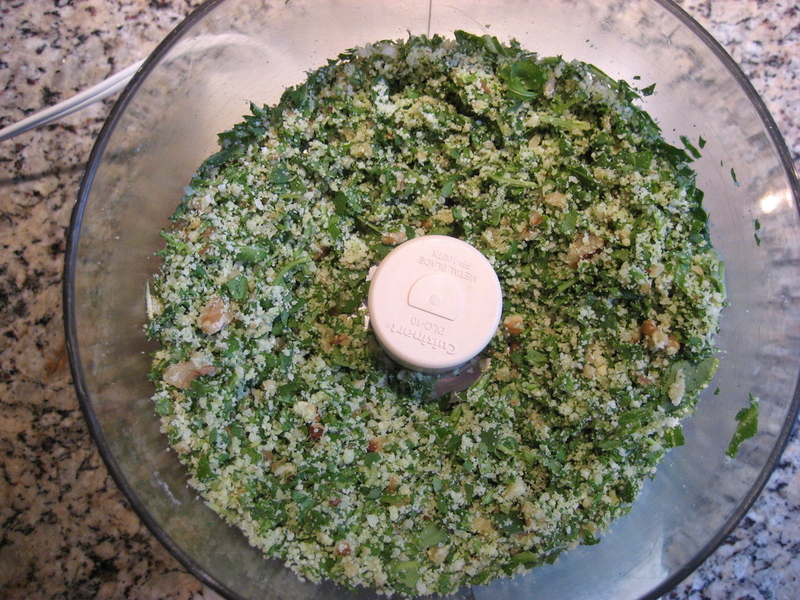 I found a recipe for arugula walnut pesto on The Live-In Kitchen blog and gave it a shot. I tweaked it a bit to my own liking; I added some salt, a little less garlic, a little more Parmesan and a little more oil to loosen it up a bit. I also didn’t toast the walnuts – toasted walnuts are yummy, but on weeknights I look for timesavers. I found I really love this pesto and have been making it at least twice a month. Besides the delicious flavor, I love the fact that you don’t have to pick all those little basil leaves, you can just pop open a bag of baby arugula and stuff them into a measuring cup – see another timesaver! I also love that this pesto keeps in the refrigerator much longer than basil pesto, which will oxidize and turn brown. The recipe makes close to 2 cups, so you can have some with pasta, slather some on sandwiches, serve some with grilled chicken…all week long! 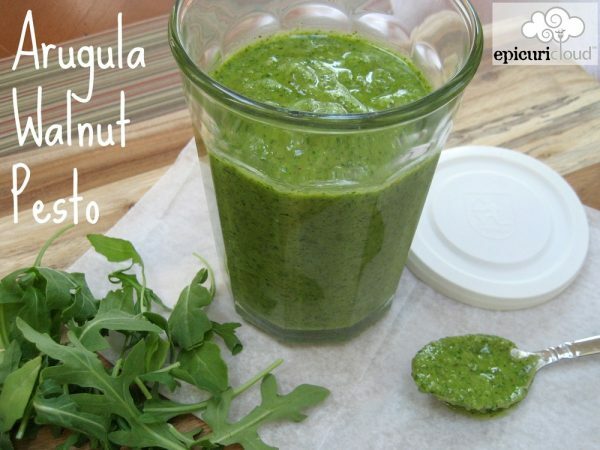 Arugula Walnut Pesto: 3 simple steps! 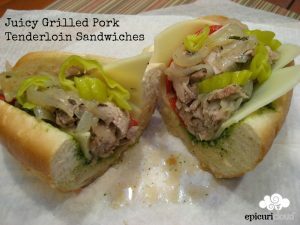 Need a recipe for using some of the pesto – check out these pork sandwiches! An easy and delicious pesto to make all year long! 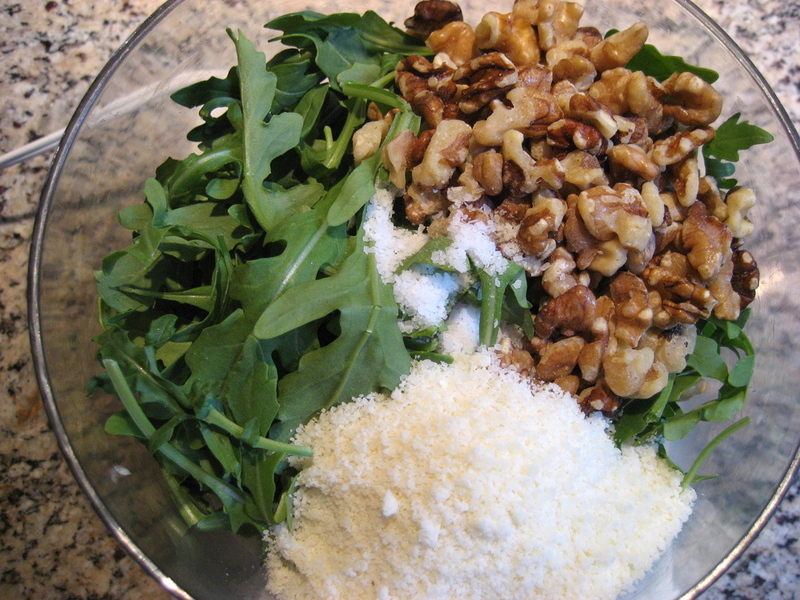 Combine arugula, garlic, walnuts, Parmesan cheese and salt in food processor or chopper. 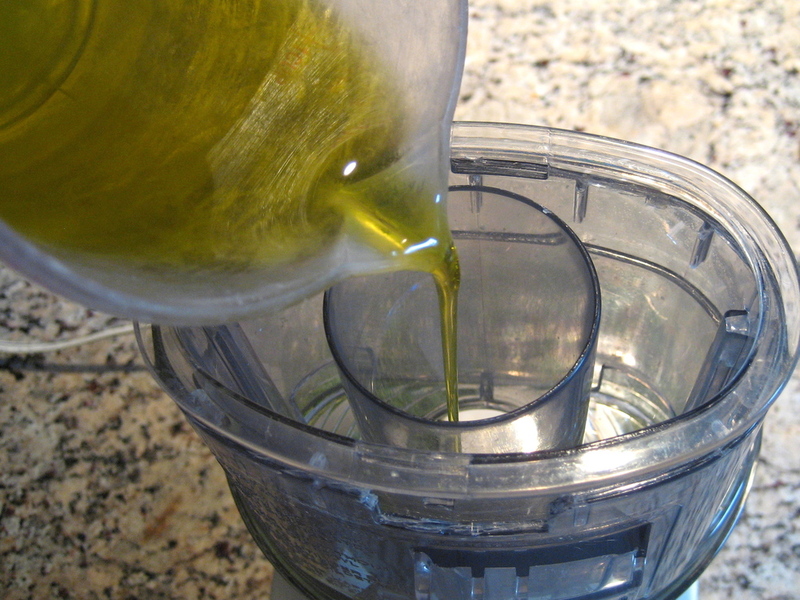 Drizzle in olive oil while food processor is running. 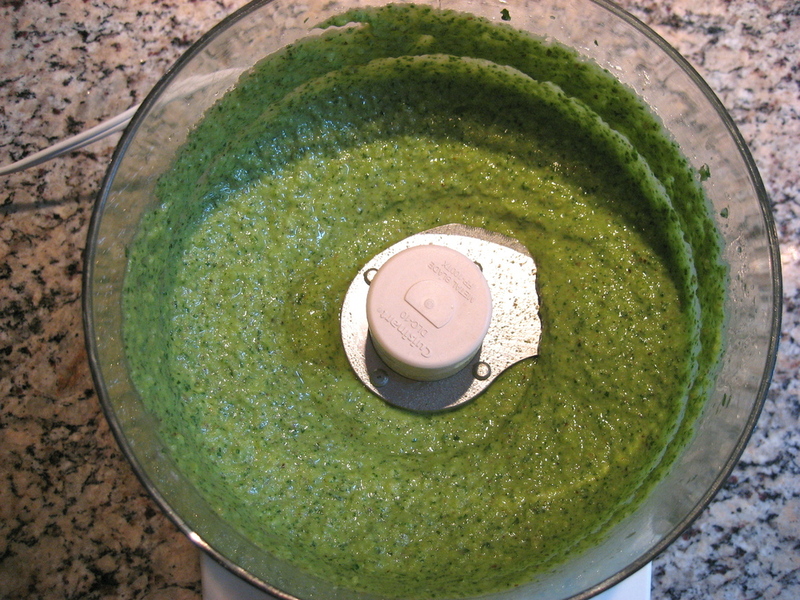 When tossing with hot pasta, use a few tablespoons of reserved pasta water to thin the pesto. 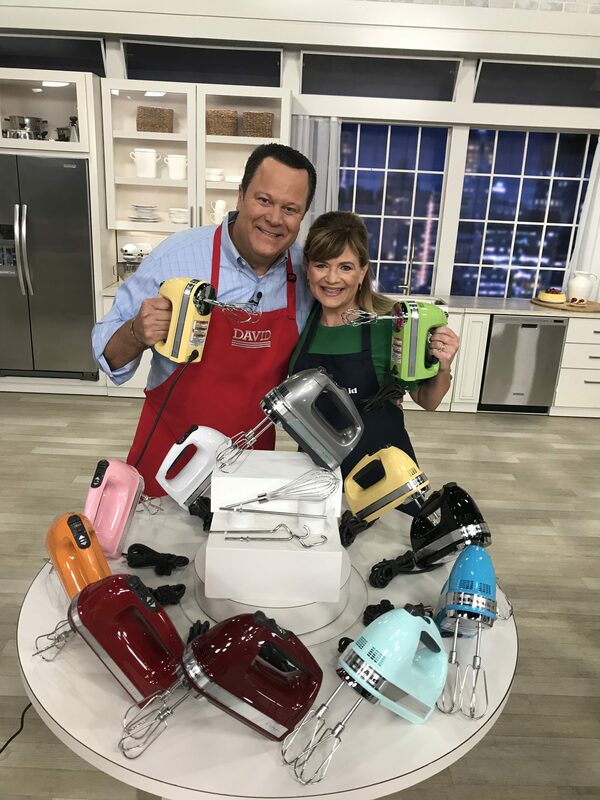 Thanks for stopping by Stephanie! Glad u like!! Just tried an oregano, basil, lemon version – will have to try a spinach one soon! Have a great summer!! The arugula pesto is excellent! Had it with orzo and my guests loved it, in a (homegrown) tomato sandwich was also very yummy, also tried it as a dip, very good too. Tomorrow I’m topping grilled fish with it. Very versatile and different than regular pesto. Thanks Tina.